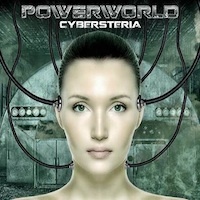 The German power metal band Powerworld is a brainchild from Ilker Ersin (ex-Freedom Call), who plays the bass and he is also the producer of their new album called 'Cybersteria'. The band was formed in 2005 and this is Powerworld's third full length album. To me is this a new acquaintance and when the first track seek it's path into my head, I hear a voice I recognize; Michael Bormann is the vocalist and that's a quality stamp for me. I expected classic German Power Metal, but Powerworld has done an album with a splendid mix of melodic progressive metal and heavy/power metal. No classic galloping high speed power metal pace. This sounds much more mature and bigger in a way, and the lyrics are very well written. The progressive parts are very technical and Andreas Rippelmeier on guitars is a real string-pro. I looked him up on the web and found that Bormann and Andreas did an album together with 'Jaded Heart' back in 2001. The fat keyboards from Marco are creating a solid and thick sound that appeals to me. Most of the tracks are in a mid-tempo and Michael's vocals are as strong as usual. I don't worship this album or feel that this album gives anything new to the metal heaven, but it just keeps a high quality standard throughout the disc and it just blew me away. It's an album that grows and if you like the melodic metal with strong and powerful vocals, packed in an half progressive and half heavy metal package, this is something to check out! I'll absolutely have this disc spin long after this review has been published. Best tracks: 'Slave to the Powerworld', 'You Gotta Hold On', 'Like a Shadow', 'You Will Find A Way' and the top track: 'Coast of Tears'. 'Cybersteria' is a very tasty and a nice music dish that will attract many metal fans! A recommended purchase!